Oh, for just one day without worrying. Just one day without the embossment of what we have to deal with on a daily basis, in the mind. The frustrations, headaches and disappointments over decisions we have to make today. Or, the reality of decisions made in the past mixed in with the future prevailing over us. Oh! Sometimes we wake up in the morning feeling the weight of the world on our shoulders. We feel surrounded by all the what-was-done, and all the what-has-to-be-done, and all the what-will-be-done. Chaos! Will this be done right? Will that one make the right choice? How far will this go before it rights itself? Questions running rampant causing the mind to be worked up into such frenzy that we can’t help but do anything but worry. All those who’s, what’s, where’s, how’s and why’s of the day waiting for our minds to process and find a solution for. No wonder so many people are so stressed out. Why even those who profess Christ feel like all this worrying has caused them to reach their limits. “I’m done. I can’t take this anymore!” becomes the cry of the battle. That’s far from the victorious battle cry that God wants to hear from His people. No wonder stress, worrying, fear and such are spoken of so often in the Bible. These things are opposed to you getting where God wants you. It repels you away from drawing nearer to Him and His goal for your life. Proverbs 12:25 declares, “Heaviness in the heart man maketh it stoop.” It’s feeling so low almost every day because the load is just too much to bear. The weight of it all makes one feel that they are trudging up a muddy hill while pulling a cart behind you. It’s too much! 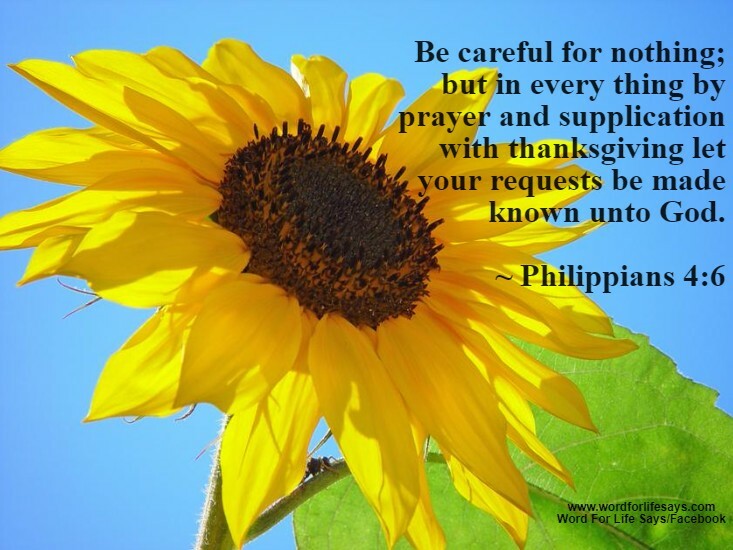 “But in everything by prayer and supplication with thanksgiving let your requests be made known unto God.” “In everything!” There is absolutely no area in your life that God doesn’t want you to trust Him for. He is concerned about all of it. If it bothers you, it bothers Him. If the waves are churning in your life, He says to give it to Me, I’ll make them behave. I, for one, am so grateful that He is not a far-off God. He’s up close and personal, and He cares. So, how do you handle this? Take it to the Lord in prayer. Many don’t heed this very simple advice. We have heard it so much yet have never made it applicable to our lives. But, this is the sure-fire method you need – pray! “Let your requests be made known unto God.” Here is something I have never noticed before until now. The word “requests” has an “s” on the end making it plural. Now, I don’t know about you but I have plural problems to deal with every day. So, when you tell me to make my “requests known” I have a laundry list of stuff that tries to overrun me. The “s” on the end means that God can handle it all and he wants you to give Him it all! He cannot be overwhelmed with what you are going through so why not let Him have it. There’s an “s” on the end! Rejoice, because you don’t have to carry it all alone. Every trial and heartache, all the way down to every disappointment and decision, we can take it all to Him today and put worry in its place so that we can be free.